At The Metro, Curtis (Donnell Turner) told Valentin (James Patrick Stuart) he should make sure his security system is up to date. Cassadine assured he could take care of Nina (Michelle Stafford) and Charlotte, announcing Nina had moved back home for good. Liesl (Kathleen Gati) warned Nina she could be disappointed where Sasha (Sofia Mattsson) was concerned. Nina reminded Liesl that Sasha wasn’t Britt, who betrayed Liesl to get out of jail. Ms. Reeves was angered when Liesl compared Sasha to Faison. Carly (Laura Wright) caught Franco (Roger Hogwarth) searching Kevin’s (Jon Lindstrom) office. Franco explained he was looking for some clue as to why Kevin was treating him differently and why nothing the psychiatrist said lately made sense. Carly admitted she was there for the same reason. Ryan (also Lindstrom) suggested Ava (Maura West) leave Port Charles with him. He told her being away from locations where her memories of Kiki (Hayley Erin) are constant can be helping her healing. He assured they can go to any country and she could open another gallery and would have backers and buyers of her merchandise. Ava agreed that starting a new life away from Port Charles would be good for her but reminded she couldn’t leave Avery. Ryan felt Carly and Sonny should be agreeable in allowing Ava to spent time with Avery regarding of where Ms. Jerome lives. Alexis (Nancy Grahan) came to Charlie’s Pub with a gift for Kristina for her new home. Sam (Kelly Monaco) expressed her concern about Shiloh and Kristina’s living situation. Jason (Steve Burton) told Sonny (Maurice Benard) about Shiloh. Kristina entered telling her father how Sam and Jason had concerns about Shiloh. Later at Charlie’s, Sam told Kristina about Shiloh’s connection to a former mark/husband. Nina called Sasha. Valentin warned Liesl about saying too much to Nina. Ava ran into Sonny at The Metro Court and told him her plans to move out of the country. She wanted Sonny to consider letting her have a few weeks with Avery. Ryan found Carly in his office. She again questioned him about Wilson Ritter, assuring she wouldn’t give up until she learned the truth. Ava called to let him know Sonny wouldn’t agree to letting her have some time with Avery. Ryan added both Carly and Sonny to his list. Anna (Finola Hughes) is eager to have the bandages removed from her eyes as she wants to know whether the procedure worked and if she can see again. She asked Finn ( Michael Easton) and Chase (Josh Swickward) to leave the room so she could talk with Griffin (Matt Cohen) alone. After Finn and Chase left, Anna asked whether she’d see again. Although they were able to stop the bleeding, there was no way to tell yet if she’d see. Aiden (Jason David) reminded Elizabeth (Rebecca Herbst) that every thing for the cake needed to be baked for the school bake sale must be homemade. Franco (Roger Hogwarth) offered to help the little boy make the cake. Willow (Katelyn MacMullen) entered Charlie’s Pub and told Julian (William deVry) a parent asked to meet her there. Julian thought it would be better if Ms. Tait left Port Charles and started fresh somewhere else. Kim (Tamara Braun) met with Dr. Terry Randolph (Cassandra James) and told her that when she spoke with Oscar (Garren Stitt) about his condition, if he asked tough questions she (Kim) wanted her to give him straightforward answers. Oscar ran into Alexis (Nancy Grahan) at General Hospital and told her he wanted to finish his will. Finding Cameron (Will Lipton) asleep in the hospital chapter and a recovery pamphlet nearby, Josslyn (Eden McCoy) asked him whether he was on drugs. Cameron told Joss about being busted for buying weed and how he was given a year probation, community service (picking up garbage by the side of the road and working at the hospital) and drug counselling. Josslyn told Cameron the clinical trial for Oscar didn’t work. Meanwhile, Oscar asked Dr. Randolph questions about whether his headaches would get worse and if he’d lose his balance and fall down more and how much longer he had. The longest a patient with his prognosis lasted for seven months and the shortest was six weeks. Elizabeth arrived and Willow told her how Aiden was faring in school. Ms. Tait told Liz how Aiden spends his recess alone in the library. Franco was surprised by how much Aiden knew about baking and asked why he never told anyone. Aiden said he didn’t want to be laughed at again. Alexis urged Julian to go to Kim. Josslyn assured Oscar she’d help him to cross as much as possible off his list. Cameron told Josslyn he was there for her. Finn and Chase returned to Anna’s hospital room in time for Griffin to remove her bandages. Anna could see. Elizabeth and Cameron came home and were surprised by Aiden’s baking skill. Aiden was excited to receive a baking book from his mom. But Cameron was concerned when he turned on Aiden’s tablet and there was a message reading “Get Lost Gayden.” Julian told Kim he heard about Oscar and was sorry. Oscar met Josslyn in the chapel, marking a date to spend time with her in his five year planner saying date was non negotiable. Carly (Laura Wright) handed Sonny (Maurice Benard) the phone so he could speak with Lucy (Lynn Herring), who was frantic and “almost at Nurse’s Ball level” due to the release of her Travel Guide to Port Charles book. After hanging up the phone, Sonny told Carly they had bigger problems. Ava (Maura West) met with Scott (Kin Shriner) at Charlie’s Pub. She added that if he did his job well he’d never have to see her again. Elizabeth (Rebecca Herbst), Franco (Roger Higwarth), Cameron (Will Lipton), Jake (Hudson West) and Aiden (Jason David) were ready for Laura’s (Genie Francis) inauguration. Aiden asked his mother whether Charlotte (Scarlett Fernandez) would be there. Elizabeth answered Scarlett could be there since she was also Laura’s grandchild. After Aiden and the adults left the room, Cam asked Jake what was going on between Aiden and Scarlett. Jake told Cameron that Scarlett was bullying Aiden. “Kevin” asked Laura to move ahead with finalizing their divorce. Laura told “Kevin” the divorce would have to wait after she takes office of mayor. She accused “Kevin” of wanting to end their marriage so he could be with Ava. At The Metro Court, Peter (Wes Ramsey) met with Lulu (Emme Ryan) and reminded her she could write what she wanted regarding the serial article, but he had the final on what was published. Worried for the safety of Port Charles residents with a killer on the loose, Mac (John J. York) and Jordan (Briana Henry) came to Crimson urging Maxie (Kirsten Storms) to cancel Lucy’s (Lynn Herring) book signing. Cameron told Jake that as Aiden’s big brother it was his (Jake) job to protect him by beating up any boy who messed with him and telling on any girl. Jake reminded Cameron that he wasn’t like him (Cameron) and also that he only saw Aiden on the bus and couldn’t follow him in school. Stella (Vernee Watson) told Curtis (Donnell Turner) that Marcus blamed her for the Mike/Yvonne situation. Meanwhile, Mike (Max Gail) had an episode where he thought he was living at Carly’s hotel and Sonny was another guest who stole his watch. Then, Mike punched Sonny! Although shocked, Carly stayed in character as the hotel owner and ordered Mike upstairs to his room unless he wanted to risk losing his security deposit. After Mike left the room, Carly asked Sonny what he’d do if Mike had another episode and came after him. Mac urged Peter to take Lulu off Maxie’s story. As she was about to take the oath of office, Laura looked down at her hand on the bible and seeing her wedding ring, removed it and announced her divorce. Then, Laura Webber was sworn in. Peter told Lulu and Maxie he changed his mind about running the story. Ava told Ryan she couldn’t leave without her daughter, doubting Sonny would allowed her to take Avery. Ryan called Carly and arranged a meeting. Carly asked whether Sonny could come along. “Kevin” had no problem with it. Alexis (Nancy Grahan) had the use of an empty room in General Hospital for the reading of Gail’s (Susan Brown) will. Anna (Finola Hughes) wondered down the halls of General Hospital taking in her surrounded as she was recently blind. She told Finn (Michael Easton) she had to find out how she contracted the mysterious virus that lead to her blindness. Nina (Michelle Stafford) set up the display for Lucy’s (Lynn Herring) book signing. She was annoyed when Willow (Katelyn MacMullen) appeared at The Metro Court for the event as Ms. Reeves was certain Ms. Tait was out to get Charlotte (Scarlett Fernandez). Lulu (Emme Rylan) and Laura (Genie Francis) found Cameron (Will Lipton) picking up trash as part of his community service. Lulu told her mother that as her story was cut, she’ll be covering stories like Lucy’s book launch. Sam (Kelly Monaco) and Jason (Steve Burton) talked about Shiloh’s (Coby Ryan MacLaughlin) seminar and Kristina. Jason wanted to come with her, but Sam reminded that the people there would take one look at him and wouldn’t open up. Jason decided to stay but urged Sam to be careful because he didn’t trust Shiloh. 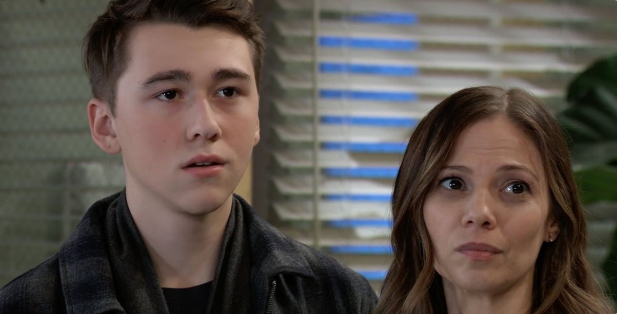 Oscar (Garren Stitt) and Josslyn (Eden McCoy) ran into Cameron picking up trash and the teens started talking about the plans Oscar and Josslyn had to see up the sights of Port Charles that Oscar may have missed. With Laura, Monica and Scott gathered, Alexis read Gail’s will which included a trust to benefit mental illness and also one for the college education of any children Serena may have in the hope one would someday go into medicine. But there was a mysterious condition that had to be reached before General Hospital could receive any of the funds. Drew (Billy Miller) texted Jason and met Morgan at Charlie’s Pub. Drew thought Josslyn was holding Oscar back from enjoying his last days but giving him false hope of a miracle cure. Drew wanted Jason to speak with Carly (Laura Wright) who could help explain to Josslyn. Valentin (James Patrick Stuart) asked Nina to marry him again. Lulu had a drink with Willow who told her about Charlotte’s recent behavior. Willow told Valentin, Lulu and Nina that Charlotte may be cheating as her last three History quizzes, including the mistakes, match her friend’s test paper. While Nina again excuse Willow of making false accusations again her (Nina) step daughter, Valentin assured that he’s been studying her history with his daughter so Charlotte shouldn’t need to cheat. At the seminar, Shiloh told the attendees that they were there to open up about a painful memory in their lives. He asked Daisy (Kelsey Wang) to assist. Kristina (Lexi Ainsworth) was the first person to speak and talked about how her old boyfriend Kiefer once got jealous and knocked her around. Sam was angry that Shiloh put Kristina through reliving such a painful memory, but Krissy assured that by talking about it she was actually working on finally healing. Curtis (Donnell Turner) expressed his concern to Nina (Michelle Stafford) about her reconciling with Valentin (James Patrick Stuart). Ryan (Jon Lindstrom) looked at his driver’s license trophies and list of victims when someone knocked on the door. Carly (Laura Wright) tried to encourage Sonny (Maurice Benard) to go with her to Kevin’s (Lindstrom) office with her for a therapy session to discuss Mike (Max Gail). Sonny wasn’t so certain that a therapy session would work but agreed to attend. Ryan was surprised his visitor turned out to be Ava (Maura West) as he was expecting Carly and Sonny. Maxie (Kirsten Storms) and Nina (Mihcelle Stafford) introduced the woman of the hour, the author of Travel Guide to Port Charles Lucy Coe (Lynn Herring). Lucy entered with her security detail as due to the killer on the loose in Port Charles, she wasn’t taking any chances. Ms. Coe read passages from her book on Valentin shooting and killing Nikolas, Faison (Anders Hove) kidnapping Robin (Kimberly McCullough) and B.J.’s heart transplant. Bobbie (Jackie Zeman) had to fight back tears at the painful memory. Ryan assured Ava that he could be very convincing and may be able to change Carly and Sonny’s mind about allowing her to take Avery. Lucy continued reading passages from her book and read about Felicia bringing Ryan to Port Charles and how she (Felicia) would have become one of Ryan’s victims if not for the support of her friends and the help of Mac Scorpio (John J. York). Chase (Josh Swickward) and Willow (Katelyn MacMullen) sat at their table reading more passages from Travel Guide to Port Charles. Willow commented on the rich history Port Charles had with many things she didn’t know about. 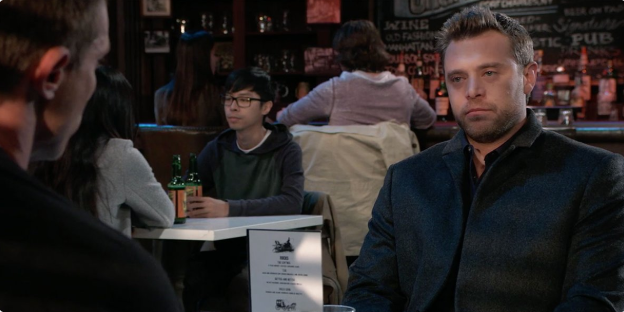 Mac talked with Peter (Wes Ramsey) and told August that he (Mac) hoped Peter had taken his advice regarding dangers of the Ryan Chamberlain article Lulu was writing. Peter assured Mac that Scorpio could trust him with his word as he would do every thing in his power to ensure Maxie’s safety. Mac told Peter that he didn’t have to call him Mr. Scorpio and could now call him Mac. Laura (Genie Francis) told Lulu (Emme Rylan) how Kevin was keeping a list of Ryan’s victims. Carly and Sonny arrived at Kevin’s office for their session. Carly explained what they were going through with Mike (Max Gail) and his Alzheimer’s and how hard it was to have someone you know suddenly act differently. Ryan told the Corinthos that he knew the real reason behind their visit and session was there guilt over what happened to Morgan. Peter reminded Lulu that he canned her story on The Ryan Chamberlain murders and ordered her to come to The Metro Court to cover Lucy’s book launch. Lulu continued to research Ryan for more information on the motive for his past murders and why he was keeping the driver’s licenses of his victims. Lulu was surprised when “Kevin” arrived at her office. Will she be his next victim?